(Mar 11): A majority of companies have financial years ending Dec 31. Most would have just finalised or are about to release their FY2018 results. They make headline stories, such as “earnings doubled” or “collapsed in earnings” and these are linked to stock price performances on the stock exchange, for publicly traded companies. It is as if these accounting numbers, as reported in the published financial statements, are gospel truths. Are they? Whether accountants, professional analysts or fund managers, bankers or amateur investors, the acceptance of these accounting results has become a convention, generally accepted if for no other reason than to facilitate discussions and decision-making. Terminologies often used include price to earnings, price to book, enterprise to Ebitda, gearing ratio, debt to equity and return on equity. 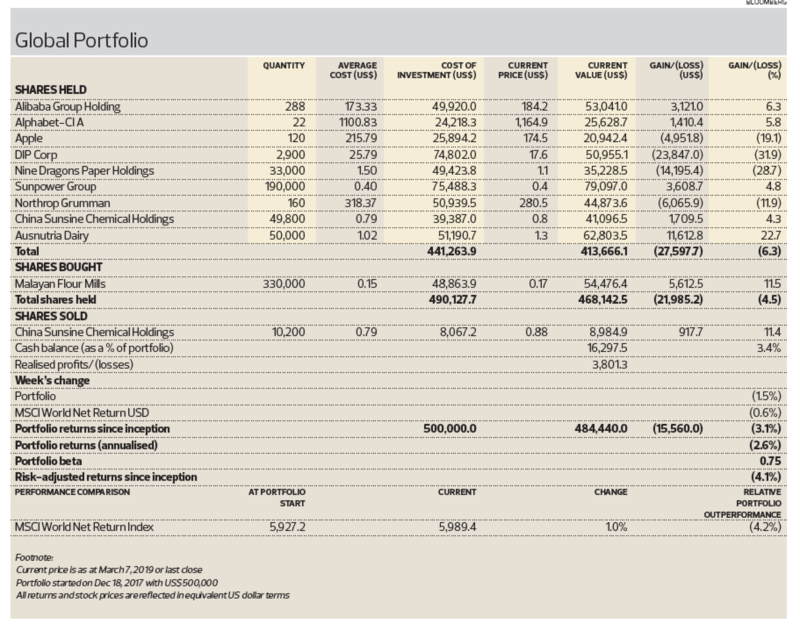 These ratios are used for comparison, to make investment decisions. What exactly are earnings or profits, book value or equity? Are they subjective and arbitrary numbers or scientific facts? The confidence in these accounting numbers could perhaps be due to the very ambitious objectives of financial statements, as articulated by the accounting profession and encapsulated in the “Trueblood Report”. Financial statements provide reliable information for economic decision-making, changes in economic resources and obligations, useful for estimating earnings and earnings potential; these financial reports contain information that is relevant, understandable, verifiable, neutral, timely, comparable and complete. Yet, objective 6, as expressed in the Trueblood Report, states that the scope of accounting measurement is to include not only factual, or objective, information, but also interpretative, or subjective, information. Objective 8 includes incomplete earnings cycle or unrealised changes in earnings. Objective 9 includes highly probable receipts and disbursements. Further, the profession stipulates that the financial statements so published will serve investors and potential investors, lenders and creditors, employees, suppliers, customers, governments and everyone else. How one set of statements could possibly equally serve so many varied and conflicting users, with the high qualitative attributes necessary, is beyond reason. To be fair, the accounting profession does highlight the limitations of relying on the financial statements audited by it. The Auditor’s Report, which forms part of the financial statements, contains many caveats and “insurable” clauses for the auditors, such as “management is responsible for the preparation of the financial statements that give a true and fair view…”, “the financial statement does not cover…” and so on. And accounting theorists remain divided on the many paradigms, which leads to alternative interpretations and preferences. Perhaps realising some of these limitations, the International Accounting Standards Board and the US Financial Accounting Standards Board last year revised the Conceptual Framework for Financial Reporting, based on fundamental economic concepts rather than a set of arbitrary conventions. Importantly, they limited the purpose to providing financial information that is useful to existing and potential investors, lenders and other creditors. This clarity of users seems to indicate that the profession is aware of its overly ambitious and unachievable objectives. So, what is “fundamental economic concepts”? Surprisingly, reference is no longer made to the entity’s ability to generate cash flows. Financial accounting is no longer intended to provide information about the value of the reporting entity. Instead, it is now even broader. The accounting profession wants its already overly ambitious objectives to be even more ambitious. Qualitatively, financial statements must have the qualities of relevance and faithful representation, besides comparability, timeliness, verifiability and understandability. To be relevant, the information must be capable of making a difference to decision makers and therefore have predictive value and/or confirmatory value. How and who defines “useful”, “has predictive value” for investors and potential investors? And at what costs, and who pays? “Faithful representation” means the information must be complete, neutral and free from error. Even the authors acknowledged that “free from error” is an impossible objective, given the inherent uncertainties, assumptions and estimates in the application of the various accounting standards. To facilitate the narrative, it is argued that faithful representation is achieved if the “process applied to produce the reported information has been selected and applied without errors”. In other words, “applying a faulty process without errors” is faithful representation. Is it? My intention is not to criticise the accounting profession or financial reporting. Financial reporting is necessary and rules must be applied for consistency, comparability and clarity. Making informed decisions depends on having reliable and timely information. And the framework for these rules and their acceptance depend on evolving theoretical paradigms. My point is the objectives as articulated are unrealistic and lead to myths and misunderstanding on the usefulness and limitations of the financial statements. For example, some accounting standards lead to the loss of useful details, which are substituted by aggregated nonsense. As an example, applying the IAS (International Accounting Standards) 2 (on inventories) and 23 (borrowing costs) on two identical property developers will have significantly different outcomes on earnings and net assets, depending on whether their land assets are classified as current or long term, and on the arbitrary decision of whether there are activities on the land. If Company A classifies 70% of its $5 billion landbank as current (close to launch), and Company B, being more conservative, classifies only 10% of its $5 billion landbank as current, and both are identical in every other aspect, Company A will report substantially higher profits (or lower losses) and higher net asset value than Company B. This is because Company B will have to expense off these costs while Company A will capitalise these costs. The ambiguity above is further compounded by the fact that Company B can achieve the same financial result as Company A by arguing that there are activities on its land held for the long term. The accounting profession will argue that the classification of qualifying assets as current and long term is not arbitrary but based on transparent and verifiable evidence. In reality, it is likely no more than evidence of intention to launch (some marketing brochures), to sell (a friendly real estate agent), some evidence of work in progress (contractors doing preliminary works) and so on. The unfortunate reality is that these arbitrary and subjective opinions and decisions have significant economic effects, such as on cost of borrowings and stock prices. In trying to improve their financials, developers are forced to forecast sales and launches more aggressively, which may have a negative effect on the industry overall. At least, it explains why developers are always forecasting higher sales yearly even in the face of an obvious market slowdown. Take another favourite of mine, IAS 22/IFRS 3 (business combinations), where a company acquires another. The acquirer must identify the acquiree’s assets, liabilities and contingent liabilities at fair value, and the difference between the cost and the net fair value of the above is recorded as goodwill. The goodwill is then amortised as an expense annually. It is as if accountants have a magical wand or formula to know the right fair value of assets and liabilities and, therefore, the value of the goodwill of an enterprise. Imagine, one is able to assign a value to brand, management track record, talent and reputation. What is the goodwill or brand value of Time Warner in the AT&T acquisition? How do we price the brand value of Coke, Procter & Gamble and Apple? I know the argument is that goodwill is the difference between cost and fair value, but surely the implication of applying IAS 22 is that it can be done in a way that is relevant, verifiable, comparable and understandable. These purchase-price adjustments not only create a confused effect on earnings for one year but also for future years, as well as on net assets. Is there any gain to the users of the financial statements for the fair-value adjustments made to the assets and liabilities of the acquiree? Or worse, do they create a false impression that these adjustments do indeed make the accounting numbers more relevant, verifiable, comparable, understandable and “truthful”? If we are honest, the fact is that the information deemed useful is going to be extremely diverse and varied, and having more realistic objectives will not only meet expectations better but may encourage more innovative and diverse forms of information and presentation. The diagram illustrates my point. There are many users and the information they find useful will not be fully aligned, although it is reasonable to assume that a huge portion will be similar for all users. Corporations also have a defined set of information they are willing to disclose. No corporation will disclose everything. And accountants will provide the information they are capable of producing and verifying, guided and necessitated by all the accounting standards. The published financial statements will contain the information available within the spaces listed as 1 and 2 in the diagram — information the corporations is willing to disclose and the accountants are capable of producing and verifying as guided by accounting standards. Only information in 1 is deemed useful to users. 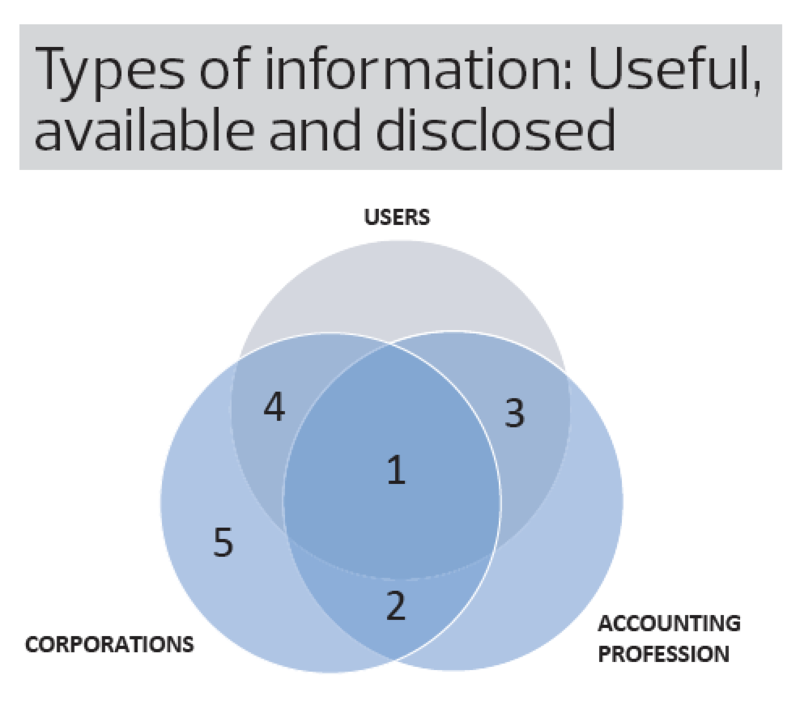 The conflict is the information within 3, which users will find useful and which accountants are able to produce, but which corporations are unwilling to disclose. Then, there is the information in 4. And this is really the reason for this article. The information in 4 is that which corporations are willing to disclose and which users find useful. But it is not contained in the financial statements because accountants are unwilling to produce or verify it, because it is not necessary or necessitated by the various accounting standards. If the objectives of the accounting profession were to be less ambitious, it will allow the acknowledgment of this set of information to be as important as those contained in the published financial statements. Yes, information in 4 and 5 is generally what companies make public through other channels, such as to mass media, analysts and fund managers. This, however, causes challenges in the way the information is released and disseminated. It also does not help that regulators are fixated on the published financial reports and view information outside the scope with suspect, thus discouraging corporations from sharing information in spaces 4 and 5 of the diagram above. I suspect many of you who read this column regularly probably find this article extremely theoretical, boring and irrelevant. I apologise, but I do have my reasons. In the weeks ahead, when space permits, I will highlight a couple of listed companies in which, had the financial statements been prepared slightly differently, with the additional information or with a change in format, investors probably would have made a very different decision. This article is the theoretical framework for my getting there. The Global Portfolio ended lower in the past one week. The share price of China Sunsine Chemical Holdings fell sharply after it released weaker earnings results for 4Q2018, both on a y-o-y and q-o-q basis. This was attributed to margins normalising from abnormally high selling prices in the past few quarters — the result of stricter environmental policies. Total volume sales remain positive, albeit lower than in preceding quarters, owing to the country’s slowing growth. We remain positive on China Sunsine’s longer-term prospects, but expect limited catalysts in the short term. By contrast, shares in Malayan Flour Mills traded sharply higher on expectations of earnings recovery in 2019, after a dismal performance last year that was affected by an outbreak in its poultry business. Operations began to normalise in 4Q2018. The stock was recently recommended by -InsiderAsia. You can check out its financials and the latest update report on the company on www.absolutelystocks.com. Total portfolio losses (since inception) now stand at 3.1%. Over the same period, the MSCI World Net Return Index is up 1.0%.